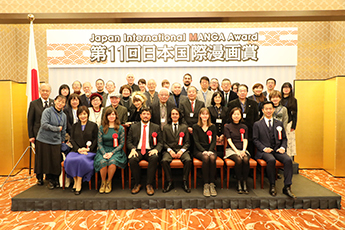 At the 11th Japan International MANGA Award, among 326 entries from 60 countries and regions, 15 works were selected this year, including one Gold Award work and three Silver Award works. On February 23, the 11th Japan International MANGA Award Ceremony were held at the Iikura Guest House. At the Award Ceremony, one Gold Award and three Silver Awards were presented with certificates of commendation by Parliamentary Vice-Minister for Foreign Affairs, Mr. Mitsunari Okamoto and trophies by Ms. Machiko Satonaka, Chairperson of the Selection Committee. Parliamentary Vice-Minister Mr. Okamoto stated that this year saw a variety of brilliant works and asked for continuous cooperation for further development of manga culture and enhanced international mutual understanding through manga. Chairperson of the Selection Committee, Ms. Satonaka gave a review of the works, in which she stated that this year was highly competitive and “life” or “existence” was seen as a common theme in the prize-winning works, and she also expected further development of manga culture. The Award Ceremony was attended by the Selection Committee members, Ms. Ban Ippongi, Mr. Mitsuru Miura, Mr. Masafumi Kumata, Mr. Kouichi Yuri, and the Executive Committee members, Ms. Saya Shiraishi, Mr. Kotaro Sugiyama, Mr. Frederik L. Schodt and Mr. Hiroyasu Ando, President of the Japan Foundation. Among the guests were famous Manga artists, publishers and people in the cultural circle and they interacted with the Award winners at the reception which followed the Ceremony. Mr. Kiyoshi YOKOTA, Director, Shogakukan Inc.
Akita Publishing Co.,Ltd, Ohzora Publishing Co.,Ltd., KADOKAWA Corporation, Kodansha Ltd., Shueisha Inc., Shogakukan Inc., Shonen-gahosha Co., Shinchosha Publishing Co., Square Enix Co.,Ltd., Takeshobo Co.,Ltd, Nihonbungeisha Co.,Ltd., Hakusensha Inc., Futabasha Publishers Ltd., Houbunsha Co.,Ltd., Leed Publishing Co.